The vineyard counts 5500 vines to the hectare whose Middle Age varies from 15 to 60 years. It is enherbé in the middle of the row to decrease the production and to increase the quality of the grounds by developing the natural humus. The vat which goes back to 1885 was entirely refitted in the Eighties. While preserving the tanks in oak, doubled stainless, Denis Corre-Macquin made build a fermenting room half stainless steel, half concrete. The temperatures of fermentation are controlled by a system of automated thermoregulation and the wine making supervised by two famous oenologists. 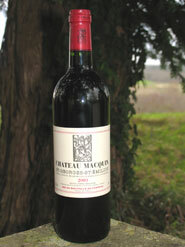 Denis Corre-Macquin grants an interest very particular to the culture of the vine; an ecological and constant interest which is the first and essential link, in its eyes, for the development of a grand cru. Today, it is too often forgotten that the excellence of a wine starts with a healthy and opened out vine. In order to still improve quality of our production, the grape harvest is carried out with the machine since 1980. Because while precisely choosing the start date of the grape harvest of each piece and while adapting the collecting to pluviometry, the grape arrives at the vat as soon as possible, in a perfect state of maturity. It is then sorted on two sort tables before being put out of tank. After a long maceration, the wine past and is put out of tank then out of barrels. The wine storehouse shelters 246 barrels of oak replaced per third every year. The wine rests from twelve to ten eight months out of barrels before being bottled where it will wait at least ten years to be tasted with its apogee.